A CREATIVE writing tutor from Leamington has found success with the help of one of Britain’s greatest ever wordsmiths. Tomato Pushing Girl by Sally Tissington, who teaches at Warwick University, won the Jane Austen Writing Prize. Her story was selected from nearly 300 submitted for the competition, which was launched by the Jane Austen Museum and the Hampshire Cultural Trust to mark the 200th anniversary of the death of the author. Writers were invited to pen a story of 2,017 words or fewer based on the title ‘Selfishness must always be forgiven you know, because there is no hope of a cure’, which is a quote from Mansfield Park. 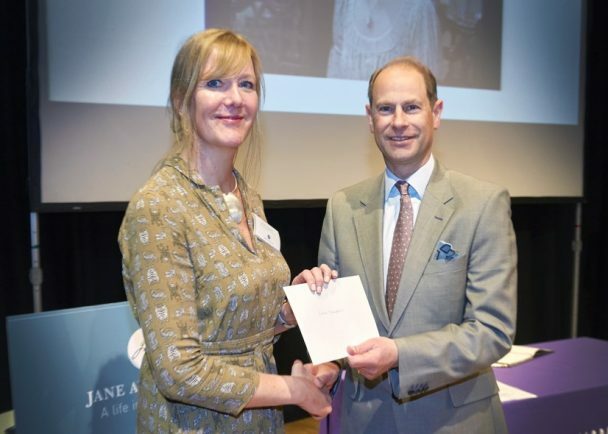 Sally was presented with a £1,000 prize by Prince Edward, the Earl of Wessex. An established author, Sally’s debut novel, Crocodile on a Carousel, was published in 2012 and she is writing a second book, as well as a collection of short stories, titled Unravel. She said: “Writing this story for the competition was a challenge I relished, and I was surprised and delighted when I found out that I had won. As well as an MA in Creative Writing from the University of East Anglia, Sally, who is originally from Shropshire, has an MA in Fine Art from the Birmingham Institute of Art and Design.